Most, if not all of the readers of this blog, are familiar with HeinOnline, and recognize it as one of the best sources for PDF versions of law review articles. You may not however be familiar with all of the available enhancements. 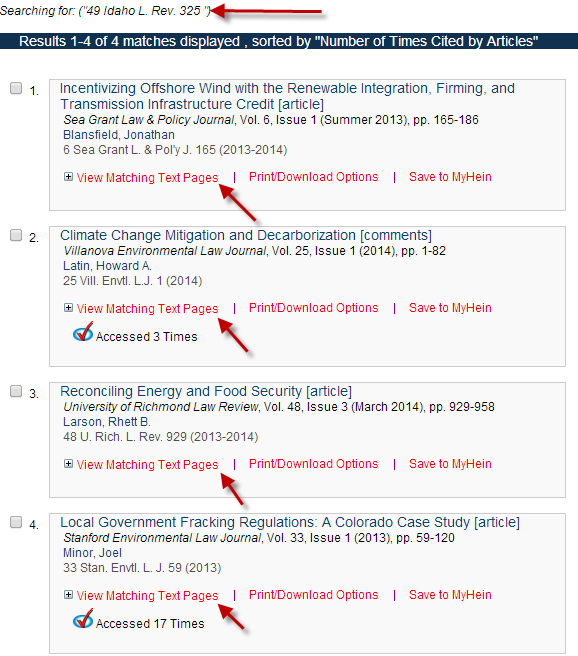 When you have completed a search in the Law Journal Library you will of course find a link to the article. You also find how many times the article has been cited within Hein online. Clicking on the link will provide you with access to the citing article. There you will find a link called “view matching text pages,” which will show you exactly where within the citing article the citation to the original article appears. By checking the number of times the article was accessed (within the most recent 12 month period), you get a sense of how important other readers considered the article.